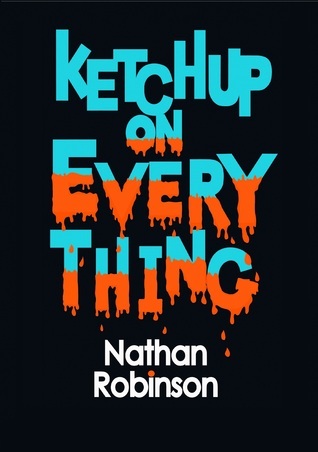 Ketchup on Everything by Nathan Robinson. Book review. It’s dusk. A motor home pulls into the car park of a provincial diner somewhere in England. Inside are Elliot Tather and an urn containing his wife’s ashes. He is scouring the country for Evan, the son who went missing twenty years before. In the course of the novella we hear about the day the boy disappeared, Elliot’s subsequent journey, and the events in the diner that night. The heart of the story is the character of Elliot, a likeable chap who reminds me of every parent I’ve ever met. When he loses his son all the certainties in his life collapse; things he thought important fade to insignificance and the tracking down of his missing son becomes a life-long obsession. This is not a novel for teenage gore-hounds. It deals with adult themes, and I don’t mean adult as a euphemism for sexual content. I mean that you’ll get more from this if you’re a parent and ever suffered that moment of panic when your child goes missing, or your child has had a serious illness. A parent will always feel the urge to do something, to sort it out, ride to the rescue, make everything better. When your best efforts are ineffectual and irrelevant, you can doubt the whole point of your existence. If you can’t do that one simple thing, protect your child, you are worthless. I don’t think any book I’ve ever read conveys this lonely helplessness better. Elliot’s horror is compounded by his responsibility to his wife, friends, relatives, and the need to show appreciation of their well meant efforts at consolation. But Robinson tightens the emotional thumbscrews further. Often when reading a book with a tortured central character we think we would help ­if only we were there. We would offer support and ease the loneliness that so often afflicts great dramatic characters. In this case we know that we would be as useless as his well meaning friends, unless we could return his son to him. This reinforcement of Elliot’s isolation by forcing us to share his impotence is a masterstroke by Robinson, effectively amplifying his pain by resonating it with our own. There is another distorted reflection of Elliot’s decimated family in the final scene in the diner, but I don’t want to even hint at what happens there, but I can tell you the story ends with hope, sadness and catharsis. Ketchup on Everything is a short horror novel about the things that really scare adults in contemporary Britain, and one that will put you through the emotional wringer. My review for the British Fantasy society of an excellent new book aimed at horror writers. 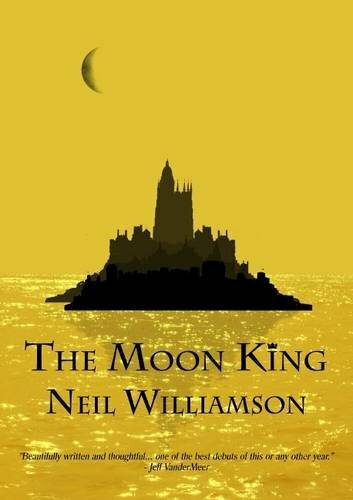 So I’ve just read Neil Williamson’s debut novel, The Moon King. As quite often happens when I read great stuff I feel under-qualified to comment on it as he is (probably) cleverer than me and (definitely) a better writer than me. But that’s never stopped me before from spouting opinions so what the hell. There is an island city ruled by immortal benevolent dictator The Lunane. When he founded the city he captured the moon and set it permanently above the city – a symbol of the city’s greatness and of his own power. As a consequence, the moon is the dominant factor in the life of Glassholm (It’s essentially Glasgow and the Glassholmers are Glaswegians). At full moon, everybody is happy and Glassholm is one big party; as the moon wanes architecture crumbles, mechanical things fail and the mood of the populace sinks until at full dark all the lights go out and there is depression and violence. This is how things have been for centuries, but suddenly things start to go awry: there is a murder at full; the luck monkeys deliver only bad luck; children made of water haunt the city, and the moon’s behaviour no longer correlates with the palace mathematicians’ calculations. I won’t go into any more details of the story because I don’t want to spoil it for anyone intending to read the book. And everyone should read this book. It’s a rip-roaring adventure, a pacy crime thriller, an inventive alternate reality fantasy, and most of all a modern fable. The prose is sweet enough to be almost invisible and the characters all genuinely breathe. All of that is enough to make it a worthwhile read, but where it gets really interesting, and where this reviewer starts to feel out of his depth, is in the subtext. The city, in order to cope with the monthly cycle of decay and repair, is sturdy and solid, the people pragmatic and stoical, surviving the dark days with a mix of bleak humour and bloody-mindedness. They are exactly like Glaswegians, and perhaps because of that I kept feeling correlations, noticing the other ways it reflected the city that spawned me. A major theme of the novel is the cyclical nature of life, though in The Moon King the only cycle that counts is the lunar one. His description of the full moon revels sound not much different from Sauchiehall street on a Saturday night: lots of loud drunk happy people, uninhibited and doing and saying things they’ll regret tomorrow. And the undercurrent of unease in this party atmosphere, the feeling that failing to join in might mark you as an outsider or a target, is portrayed perfectly in the novel. Glasgow on a Tuesday night is a very different place. The cycle of decay and repair happens in Glasgow too, but over a year rather than a month. Our winters are harsh, but not so cold that the temperature stays below freezing for weeks at a time. Water seeps into cracks in walls or roads, freezes and widens them, again and again over the winter. Then the January storms come and roof tiles, trees and trampolines fly around causing more damage. With the spring sunshine come the workies repairing potholes and rebuilding architecture. Another major theme is conservatism, linked with complacency and fear of change, even when the status quo is deeply flawed and a bit sinister. In a way it could be taken as a comment on the current Scottish independence debate, if he hadn’t told me he’d started writing it nine years ago. And finally, perhaps its most blatantly fabulist theme is the danger of trying to interfere with nature. We might think we’re in charge but she will have her way in the end – even a thousand years of the illusion of control can crumble when nature retakes the reins. Some of it is still spinning around in my head and I’ll quite possibly change my mind about everything I just wrote in the coming weeks. Overall, this is a highly rewarding reading experience that works on as many levels as you want it to. He leaves a lot of the details vague, giving us room to fill in our own ideas, showing the reader some respect. Extra marks just for that Neil.